Home Unlabelled Really Dumb” Weight Loss Secrets Revealed From A Man Who Dropped 100 Pounds In 12 Months! 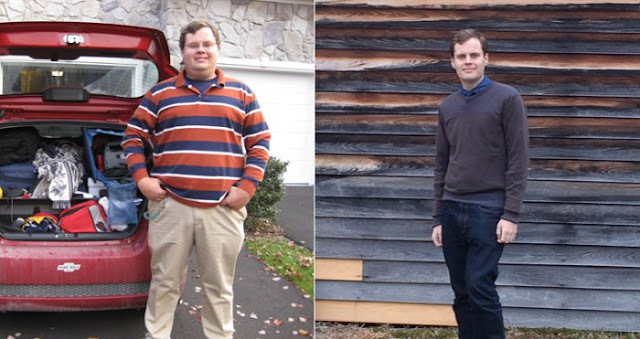 Really Dumb” Weight Loss Secrets Revealed From A Man Who Dropped 100 Pounds In 12 Months! Whether you are overweight or not, in your lifetime you would have got more ‘tips’ to lose weight than tips to help the homeless. Maybe it would have been “eat a high-protein breakfast; avoid sugar, salt, and oily stuff; go for an evening walk; the key is diet, not exercise; eat your heart out but exercise; drink plenty of water; stay away from junk food; sleep 8 hours; weight training is a must…” The list goes on. Unfortunately, this free advice rarely works in reality. For the uninitiated, more than one–third (78.6 million) of U.S. adults are obese, resulting in medical costs of $147 billion per year. So, how do you shed those extra kilos, burn fat, and get a toned and healthy body? Walk briskly for an hour on the treadmill — while watching Netflix on iPad — everyday for a year. And no, this is not one of those expert ideas that never worked. Alasdair Wilkins, 27-year-old science and medical journalism master’s student at the University of North Carolina, weighed 285 pounds 12 months ago. Today he weighs 185 pounds. He recently chronicled his journey for Vox, how he lost 100 pounds, and what life changes he experienced as a result. Basically, I just went to the gym, and I … walked. On a treadmill, uphill, at a brisk pace, for about an hour every day — and I do mean every day — from July  to April . That’s more or less it! I started grad school in August, which meant I moved out of my parents’ house and away from their immaculately stocked refrigerator, and also meant the place where I worked all day was located more than a 10-foot walk from where I slept, which also helped, but that’s more or less it! That is not something I can monetize. I never would have lost 100 pounds if that’s what I had set out to do. Indeed, the weight loss only happened as soon as I had given up hope of losing weight at all. When I went back to the gym last July, my only real goal was to start feeling a little better about myself. If I had any weight-related goal at all, it was probably on the order of 5 to 10 pounds, and losing 20 would have made me ecstatic. Because I wasn’t putting pressure on myself to lose 100 pounds all at once — or in this case, at all — I sidestepped the biggest danger when it comes to weight loss: discouragement. The thing is, though, it was a lot easier for me to hop on a treadmill than to cut portions, at least at first. So I just ignored the (frequently contradictory) mountains of literature on the best way to lose weight and just focused on finding a way that worked for me… The weight loss succeeded because I found a way to be extreme in moderation. Losing 100 pounds can’t have been some titanic act of individual will, as I’ve proven fairly conclusively over the first 26 years of my life that my willpower is mediocre at best. Instead, I managed to reshape my environment so that the result was weight loss, rather than continued obesity. I constructed a life for myself in which my physical appearance just never, ever came up, as any reminder of how I looked took me right back to the core of my self-hatred. Pulling that off meant placing strict limits on what I considered myself capable of. I convinced myself that nobody could ever consider me attractive. At 26, I had never been in a relationship—I’d never even been kissed—and it was torture for me to even talk about the possibility of romance, because doing so necessarily meant thinking about how I must appear to others. More than that, it meant being honest with and accepting of myself, two things I was just not prepared to do. Another advantage I had, both while being fat and while losing weight, was that as a man I could live in a space largely free of judgments. I can think of only two occasions in my entire life where I was made to feel self-conscious about my weight, and neither was particularly mean-spirited. Now, it isn’t that being bullied over one’s weight is an experience unique to women, as I suspect my experience is on the extreme end even for men. But I suspect such light treatment was only possible in the first place because I’m a man. I received less criticism at 100 pounds overweight in my entire life than a woman 10 pounds overweight does in, what, a month? A week? A day? There’s a robust medical consensus that obesity is associated with a whole lot of serious medical issues. There are health risks to being fat. But there are also health risks to making oneself miserable by going on unsustainably extreme diet and exercise regimens. This all gets much more complicated when we look again at society at large, how it systematically drives people toward gaining weight and then makes them feel like failures the moment they do so… In the meantime, I’d arguethere’s room for everyone to determine for themselves how best to balance the physical and mental aspects of their own weight. Maybe the healthiest life means losing weight, but that won’t necessarily always be the case. The problem was never really my weight, but my own inability to deal with my weight. So sure, congratulate me on losing 100 pounds if you want — of course I enjoy all the compliments I get — but the really important thing here is a more general sense of wellness: physically, mentally, and everything else. And if that’s the case, let’s celebrate and encourage, not criticize and stigmatize all those who don’t have to lose a ridiculous amount of weight just to reach that point.